Die Etiketten sind sehr haltbar und nützlich. 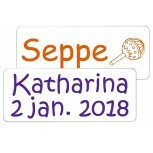 Kundenservice ist sehr gut und schnell erreichbar. Versand schnell und insgesamt freundlicher Ton. 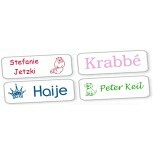 Preis ist OK.
Large name tags are ideal for marking lunch items, toys or storage boxes. Dishwasher & microwave safe. They have enough space for first and last name, or telephone number. Design yourself with the favorite icon of your child. 30 pcs. Super original sticky labels, partly reversed. Extra fun for your Bento lunch box! 40 pcs. 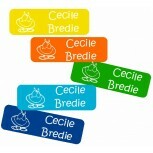 Large Sticky white name Labels are handy on stock boxes, school supplies and camping gear. 30 pcs. Large vinyl colorful namelabels are useful on large storage boxes and various camping gear. 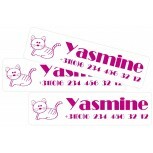 Large Name Labels Ton sur Ton. 5 Color set! 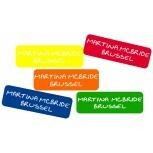 5x 10 pcs.Recognizable girls labels for lunch items and toys. 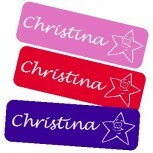 Large Name Labels Multi Color. 5 Color set! 5x 10 pcs. Neatly name labels for lunch items and toys. 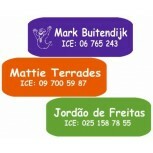 Large Name Labels Vario. 5 Color set! 5x 10 pcs. Recognizable stick-on labels for lunch items and toys. 30 pcs. 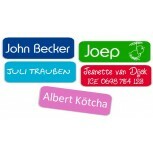 Label Trio name tags are large, striking and pretty but also durable. 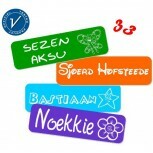 30 pcs Name Label Trio for boys. 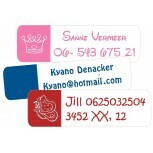 Name tags are large, striking and pretty but also durable. 40 pcs. Large vinyl name labels are useful on sports equipment and musical instruments. 33 pcs. The best name tags, nice priced, best quality. Easy to apply, original and sustainable . Do we need to say more? 30 pcs. Unique design name label, also for application to Rosti Mepal products.